You know I really love scented candles. They’re a great way to freshen up the house especially after cooking fish or anything with garlic and onions. I especially enjoy burning scented candles around the holiday times. There is nothing like the fresh smell of pumpkin pie, cookie dough or Christmas pine scent to really put you in a jovial mood. I am always on the hunt for natural candles that provide a soothing yet not overpowering scent. With little ones around the house I do not want to burn anything toxic or overpowering. 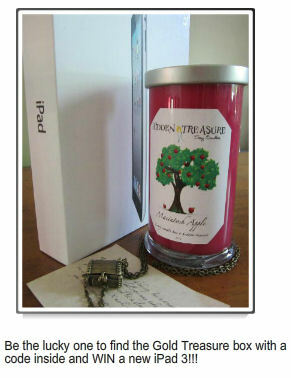 Recently I was contacted by a company called Hidden Treasure Candles to review their products. They produce earth friendly all natural soy scented soy candles. Each candle is hand made in Hershey, Pennsylvania. Aside from the great look and scents of their candles they offer an added surprise. Within each candle they sell is a hidden treasure wrapped in foil. All candles sold have a hidden treasure. You might be the lucky one who finds an iPad code, a Le Vian Necklace or the grand prize Tiffany and Co. Pendant worth $5,000 or a number of other fantastic prizes. But regardless of the big prizes, in every candle you will find a gold plated or a silver plated necklace. All you have to do is use the candle until it burns down to foil wrapper and then you’ve got your surprise. After receiving my candle I was really happy with the way it looked. The candle was large and had a nice wick. The scent I chose to review called Summer Breeze. It is very mild, not over powering, it also smelled good and filled my home with a calming aroma. I could see the foil pouch embedded in the wax about a quarter of the way down from the top. I knew my husband was impatiently waiting to see if we won a new Ipad 3 so I let him go digging in the wax after burning the candle for 3 hours or so. He was able to dig out the foil prize and after unwrapping it we found this cute gold plated necklace with a charm pendant. It wasn’t the prize he was hoping for but it was still a really nice surprise. Now I’m thinking I should have reviewed the Macintosh Apple Candle lol because it kinda would make sense if the ipad code would be hidden in Apple named product? Oh well…The second candle is going to my winner when we do a giveaway. I hope you will be the lucky one! If you’re going to buy a candle you might as well have the chance of winning a prize. I would give these candles a five star rating. The burn clean, with a very pleasant aroma and they look great doing so. They also offer that anticipation factor that comes along with possibility of winning a great prize. Although everyone is a winner with these candles. I think this would make a good Christmas gift. 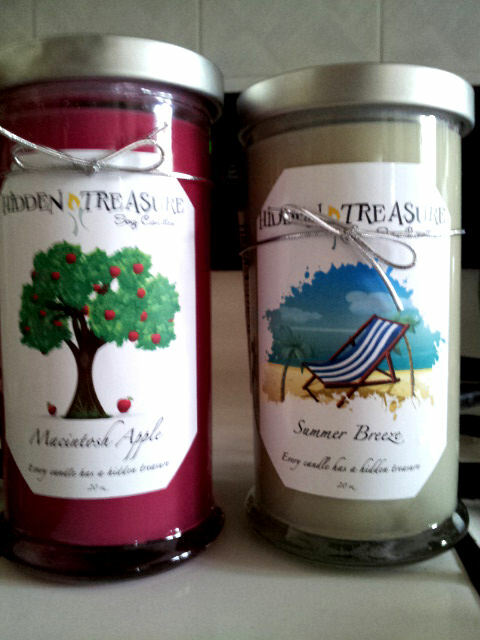 Disclaimer: The Candles were provided to us by Hidden Treasure Candles for free in order to test out the product. The views expressed in this review are mine and mine alone. Please tell me what do you think about this product? « Is Your Kid Athlete Eating the Right Foods?